Mega Movie Week sale: iTunes 4K HDR films available from £1.99 | What Hi-Fi? Coach potatoes needn't find an excuse to camp in front of the telly and binge hard this week - it's Mega Movie Week! That means that from today until Sunday (27th) digital film services such as Sky, BT, Amazon Prime, Rakuten, Google and Apple are offering discounts on its 'buy to keep' films from now right through until Sunday - including some films in 4K and HDR. In other words, now is the perfect time to grow your digital library. 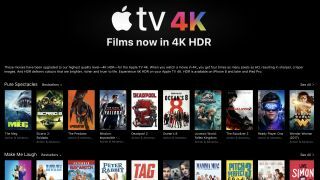 Apple is currently offering select 4K HDR films for as little as £1.99 on its iTunes service. Maze Runner is £1.99, while the likes of Atomic Blonde (Dolby Vision), Pitch Perfect 3, The Snowman, Now You See Me 2 (Dolby Vision) and American Made are just £2.99. Mega Movie Week runs from Jan 21st – Jan 27th. Visit www.megamovieweek.co.uk to find out more. Rakuten also has a 4K film sale, which includes new releases such as The Meg (a no brainer), The Greatest Showman, Ready Player One and Jurassic World: Fallen Kingdom. If you have a 4K TV with a Sky Q box and/or Amazon Prime subscription, it's worth checking whether Sky's or Amazon's sales include any of their 4K HDR films. As for HD films, Sky has dropped the prices of hundreds of films in its well-stocked catalogue, including relatively new titles. We'd recommend A Quiet Place (now £4.99 HD download or £7.99 with the Blu-ray copy too), Upgrade, BlacKkKlansman and Three Billboards Outside Ebbing, Missouri (£2.99 for each HD download) and Paddington 2 (£4.99 HD download). The BT TV Store, Amazon Prime Video and the Google Play Store have similarly appetising sales this week.